For those that get into podcasting, one of the worries is whether they will be able to get enough guests to support a weekly podcast show. To some this may seem daunting or that it would take a TON of time. I assumed I’d have to hire a guest booking agency to support my show and find me guests when I started 2 years ago. I’ve been blessed and haven’t had to – although I do have some clients that use the service – it can take a ton off your plate! 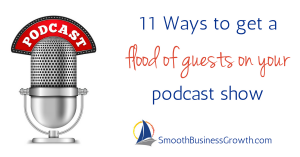 Here are my tips that I’ve used to keep a steady flow of guests on Smooth Business Growth Podcast (formerly Sailing To Success Podcast). First and foremost, before you invite someone, I want to make sure that you invite guests for the right reasons. Your first priority should be your audience. Would the guest be sharing information that they would find useful or serve them, motivate them or inspire them? Are you interested in the potential guests’ area of expertise? My assumption often was if I want to know more, and they can help me understand xyz about a topic, it would serve my audience (a fellow entrepreneur) as well. So now that I have THAT out of the way – here we go! 1.Use your connections – between your clients, your team, your peers, connections in your mastermind groups or courses you’ve taken. You probably know more people than you realize. 2.Use referrals – after having a guest on the show, ask them who they know that would make a fabulous guest on your show. You’d be surprised how many connections would come your way! 3.Ask for introductions – if one of your peers had a guest one their show and you really enjoyed what they had to say don’t be afraid to ask for introductions. Explain how much you enjoyed that episode and would they mind introducing you to that guest that you know they would serve your audience perfectly on your show. 4.Take advantage of opportunities – many of us are speakers at events, or are guests for virtual summits. I remember how thrilled I was to be on a panel discussion for a summit with Baird Hall of Wavve.co and Hani Moura of Simple Podcast Press. The discussion we had was so much fun, so I felt comfortable asking them after the show if they would like to be a guest on my podcast show. Take advantage of those NEW connections and opportunities. 5.Reciprocate – if you are a guest on someone’s show – why not reciprocate and ask them to be on your show to chat about ‘xyz’. I bet they would be honored! Don’t be afraid to ask – I’ve made some great connections on LinkedIn and asked to share an entrepreneur’s blog. He was thrilled. I read more of his material and continued the conversation on LinkedIn and invited him to be a guest on my show. The ask is important – make sure you share the purpose of your show, who your audience is. It’s a great idea to craft some topic ideas for the show, areas of their expertise that you would love to share. It makes them feel good, shows that you did your research and put thought into it, and they can check out your show and know if it’s a fit. Invite the owners of services you use – I love tools and having the owner/creator of a service I use on my show is super exciting for me. Knowing that I use their service and that my audience would be a good match to also use the service is a win-win. Offer invitations online – you can always use a call to action on Live Facebook videos etc – and have a form to fill out on your website. Ask if you want to be a guest on my show, go to xyz.com to fill out your application. Just make sure you do your homework and check them out, their business and what shows they’ve been on to see if they a fit. Look for new authors – authors with a new book out LOVE to market their book. Don’t be afraid to find out who newly released a book, or has one coming up. Chances are they would love to be invited to share their book with your audience! Having a great reputation, successful show and great networking will also garner you a ton of guests as time goes on. In fact, I get contacted weekly with pitches and requests to be on my show – I’m so blessed! Just don’t let the worry of getting guests for your show be what is holding you back from podcasting. It’s not as hard as it looks! If you are wanting to start a podcast show OR are currently producing your own and want more time to focus on your business (instead of in your business) reach out to us. We do full production services for podcasters including show notes and promotion! Email us at info@smoothbusinessgrowth.com – it’s that easy!